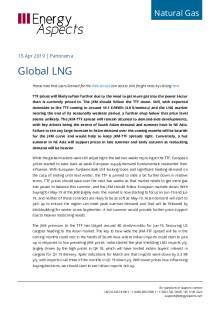 The global gas market is getting very bearish, with TTF prices softening further as coal prices begin to chase market share. The sharpness of the fall at the TTF has started to outpace drops in the JKM, putting some value back into the JKM-TTF spread. More TTF downside could well be seen if coal and carbon fall further, and with weather in North East Asia still mild for the time of year, it is just a matter of time before the JKM tumbles again. With freight rates dropping, the JKM-TTF spread should continue to be drawn below the breakeven arb, which now suggests it will narrow to below 0.7 $/mmbtu. 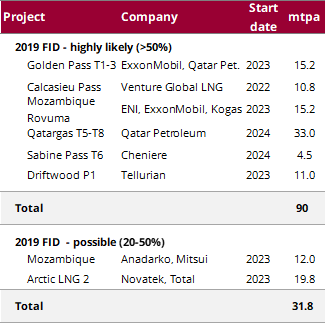 Despite the pervasive bearishness, last week’s unexpected FID on the 15 Mtpa Golden Pass and significant progress on concluding deals for the 12 Mtpa Mozambique LNG project mean that FIDs we expect to be taken in 2019 will cover some 102 Mtpa of new supply. A growing bearishness at EU gas hubs has been dragging global gas prices down. EU hubs look well supplied on the promise of continued incremental LNG supply and healthy storage levels. Total European gas inventories stood 6.7 bcm higher y/y on 10 February, and we forecast that to grow to 15–20 bcm by end-March. With EU weather forecasts looking warmer than normal for the next two weeks, TTF gas is pricing in much more gas into power y/y, with gas taking an increasing share of generation from hard coal. Cif ARA hard coal prices started to drop dramatically at the end of last week in order to compete with gas, in turn triggering a further fall at the TTF, with the TTF summer 2019-delivery strip closing the week at 6.0 $/mmbtu. With European coal and gas prices potentially entering a race to the bottom, JKM prices fell, but not by as much as the TTF. At Friday’s close, the JKM-TTF spread had widened, going from an average of 0.44 $/mmbtu for the summer strip in the previous week to 0.91 $/mmbtu. With freight rates dropping by an average of 6,200 $/d to 55,300 $/d, the netbacks for US LNG are swinging mildly back in favour of cargoes heading to Asia, with the breakeven JKM-TTF spread coming in around 0.7 $/mmbtu. Given there is potential for the TTF to fall further, particularly if Cif ARA coal or EU carbon prices dip again, the bear run for summer 2019-delivery LNG set to continue a while yet. In terms of the supply arbs, US Henry Hub Sum-19 is pricing at 2.7 $/mmbtu and the export arb is only likely to close if global prices fall to 4.0 $/mmbtu, but even the threat of that might push Henry Hub down still further. While US exports look assured, some supply response could come out of the Australian LNG export terminals in Queensland. While Australian summer is the peak for domestic gas demand in Queensland, Brisbane hub prices are trading around 9 AUS$/GJ (6 USD$/mmbtu). With the JKM Sum-19 dropping below 7 $/mmbtu and the cost of the Curtis Island–JKM trade being around 0.6 $/mmbtu, the arb window is near to closure. Even when such a diversion is economic, there are significant limits on what can be sold back into the local Queensland market. 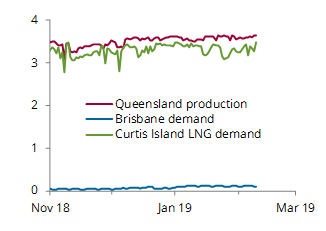 Peak summer demand at the Brisbane hub is a little more than 0.1 bcf/d, while feedgas demand at Curtis Island is some 3.5 bcf/d. Even if total Brisbane gas demand was to be met by gas diverted from LNG exports, this volume would be only around 3% of the feedgas that would flow into Curtis Island. In our recent Insight: Liquefaction FIDs and regas starts, 1 February 2019, we outlined what LNG supply projects we thought would get the go-ahead this year. The 15.2 Mtpa Golden Pass LNG, owned by Qatar Petroleum (QP) and ExxonMobil, was not among those we considered most likely. The reason was that Golden Pass LNG had been held up in regulatory limbo for a few years, suggesting that its main sponsors were focussing on other projects first. For QP, priority was to be the 33 Mtpa expansion of its production facilities at Ras Laffan. ExxonMobil, meanwhile, has a long list of advanced projects, including the 15.2 Mtpa Rovuma project in Mozambique (which was announced in December as having fully subscribed offtake), the 8.1 Mtpa Papua New Guinea project expansion (which has gone out to debt syndication to meet its project requirements), and some presumed participation in the Qatari expansion. So why have QP and ExxonMobil decided to take an FID first on Golden Pass, which has no announced offtakers, is being merchant-financed and seems to be lagging behind in the affections of the two main project developers? One explanation—and probably the most convincing—is that both ExxonMobil and QP have US upstream assets that they are keen to monetise in the global gas markets rather than the more depressed Texas gas hubs. Another reason is that QP wants to curry favour with the US, as seen in its public announcement that it intends to invest $20 billion in oil and gas assets in the US over ‘the coming few years’. Given the current Trump administration has largely been pro-Saudi, the Qataris could be trying to score political points in Washington and earn some leverage against Riyadh, with whom Doha continues to be locked in a diplomatic feud. The decision could also be seen as a spoiler to other US-based projects, such as Venture Global’s 10.8 Mtpa Calcasieu Pass LNG and Tellurian’s 11 Mtpa Driftwood P1 project, which are both talking up FIDs in H1 19. In this scenario, the Golden Pass LNG decision could be seen as an attempt by QP to make it even harder for other US projects that are commercially less advanced than these three projects find offtakers. In reality, we see the Golden Pass move as motivated by all three of the above considerations. Another project that we consider likely to get a positive FID (but more probably in 2020) is the Anadarko-led 12.9 Mtpa Mozambique LNG project, which last week managed to convert a number of ‘agreements in principle’ into binding sales agreements. The recent binding agreements with the project include a 13-year, 2-Mtpa agreement with Shell and a 25-year, 2.6-Mtpa joint purchasing agreement with Tokyo Gas and Centrica. In the previous week, the project announced a 13-year, 1.5-Mtpa binding supply agreement with CNOOC. The flurry of deals takes the project’s firm offtake to 7.6 Mtpa, which means that it could probably move to an FID if it manages to convert one more SPA, taking total offtake agreements over 9 Mtpa. With the surprise FID on Golden Pass LNG, and if Mozambique LNG keeps up the momentum on completing supply agreements, our expectation of FIDs in 2019 would then swell to some 102 Mtpa of new LNG supply capacity, up from the 74.5 Mtpa we had been expecting.